At Indigo, we agree with this mindset. Agriculture needs more products whose results speak for themselves. In the early days of Indigo, I joked that if we were right about the plant microbiome’s immense potential to improve crop yields, the effects of our products would be visible on the ground – and from outer space! This spring we looked and we’re excited to announce that, yes, in fact, you really can see the benefits of Indigo’s products from space. Until now, we’ve measured our effects by conducting side-by-side trials planted by growers on their own farms. (That is, Indigo Wheat gets planted alongside a “control” wheat, which is the same cultivar without our microbial seed treatment. Each “side” is harvested separately and yields are compared.) While beneficial, this method does not scale to monitoring commercial results on tens or hundreds of thousands of acres. As we continue expanding the scale of Indigo’s commercial operations, we want tools that can allow us to monitor the impact Indigo has on every grower’s farm, and to systematically compare these results to the performance of their neighbors and their entire region. A bird’s eye view, it turned out, wasn’t high enough to capture the ground we need to cover. To account for the growers who planted our seeds, the ones that did not, and to uniformly gather the level of detail we needed, we had to step miles and miles back – all the way up into space. 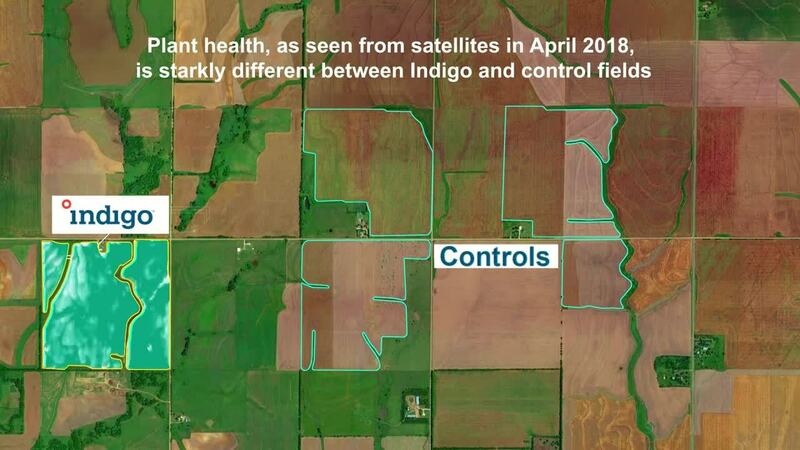 Satellites, and the constellations they form when working in unison, provided a unique opportunity to analyze 40,000 acres of Indigo commercial fields for the entire duration of the wheat season. From this distance, we were able to view tens of “control” fields – i.e., fields from neighbors of Indigo farmers that didn’t plant Indigo Wheat – for every one field planted with Indigo Wheat. Three of the most popular satellite constellations were essential to gathering over a thousand variables for each field: Sentinel, MODIS, and Landsat. These constellations circle our planet every day, amassing a photo album that, when pieced together, account for the entirety of Earth’s surface. These satellites collect data using state-of-the-art cameras that can “see” far beyond what the human eye is capable of seeing. We see the world in three color bands of red, green, and blue. The satellites put into space by NASA and the European Space Agency can measure between 5 and 25 bands of light. Scientists have found ways of combining these bands to monitor plant health – all from over 10,000 miles away. The most common, but certainly not the only, measurement is called the Normalized Difference Vegetation Index (NDVI). After harvest, Indigo worked with growers who had planted Indigo Wheat to collect yield and quality results from their fields. We used data from those satellites – plus local weather data – to train computer models to predict the yield for each field. We tested our model by withholding 20% of the fields and found it had a predictive accuracy of nearly 85%. We then used the same satellite and weather data to predict the yield on hundreds of neighboring “control” fields. These fields are neighbors of Indigo farmers that didn’t plant Indigo Wheat. When we compared the yield of those fields to those growing Indigo Wheat, we saw a striking difference – Indigo fields showed a 12.7% median yield increase in the same region. This assessment of Indigo’s performance against their neighbors across 40,000 acres highlights the kind of impact Indigo’s products are having on farms. It also gives a glimpse into the yield benefits that neighbors of Indigo growers – and perhaps whole regions of wheat growers – could achieve by working with Indigo. This is just the beginning for Indigo. Whereas many agriculture products stay the same after commercialization, our commitment is to continually innovate. A few months ago, I wrote about our launch of the world’s largest agricultural lab via Indigo Research Partners and our effort to instrument fields and conduct large numbers of quantitative, real-word experiments instead of the industry standard of small plot field trials. Our expansion into satellites and remote sensing allows us to also collect data across every Indigo commercial acre and feed the results into our data science and machine learning teams. This will allow us to improve our products, our advice to growers, and to further increase grower profitability season after season. If you’re a grower, and you want your farm to look better than your neighbor’s – whether driving by at 65 miles per hour or flying by at 10,000 miles per hour from outer space – let’s work together.